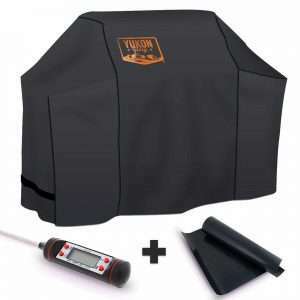 Rating: 4.6 Reviewed by EddieThe Yukon Glory 7573 grill cover is a great cover to fit your Weber Spirit 200 and 300 series grill and the Genesis silver A and B gas grills. Just pay attention that it will not fit the The Weber Spirit models from 2013 and up. Available in The Colors Black, Tan and the popular Tan with the US Flag on it. This is the black version of the Yukon glory 7573. This version comes with a hand held thermometer and a BBQ grill mat for under the grill. Click here or on the picture to see the price. This version of the Yukon glory 7573 has the US flag on it and this makes it one of the most popular versions. Like you can see there are three available models available for the Yukon Glory original 7573 premium cover and each of them come with a little extra. 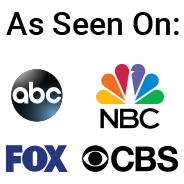 The quality of all three of them is however the same and we will dig a little deeper in the customer reviews of this what some people called replacement grill cover for your Weber grill. One more time. This cover will not fit the newer Weber Spirit grill with the control knobs mounted on the front. This are basically the models from 2013 and up. One tip I have is to try the grill cover as soon as you get home. This is still a handmade product and dimension can vary slightly. With an average of 92% people rating this Yukon glory with a 4 and 5 star rating there are probably not to many cons to find, but here is what we found. Some complaints (about 2%) talking about the longevity of this grill cover and although I agree that it should last a couple of years it always surprises me that people buy a product, that ranges from about 30 to 37 dollar, keep it out in the sun and the rain and expect it to last a lifetime. There is no grill cover that will last forever. That is just a fact. However the number of complaints about this are very low compared to other grill cover reviews we did. We still had to mention it. A few buyers mentioned that they would like a mesh window like the Weber use to have. Personally I never had the need for it since I grill a lot, but if you keep your grill covered for a long time it can maybe trap same moisture under the cover. 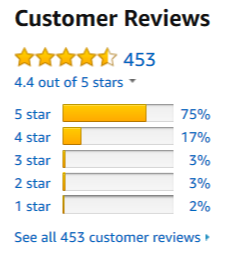 I could write a long part about what the higher (4 and 5 stars) ratings mention but I think that a summary is maybe easier for you to read. 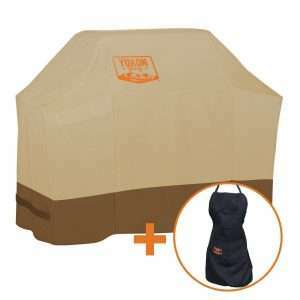 Since Weber does not offer a grill cover in this size there are several companies that try to fill that gap. Some people are such a Weber fan that they will not like it without that name on it, but I believe that other companies also make quality grill covers. This Yukon glory is a good example of this. Overall this grill cover receives some good ratings and many buyer wrote that it is a good buy specially compared to the price. We can recommend it as a good buy and if you like to see an other comparable Weber 7573 replacement grill cover you can have a look at that link. 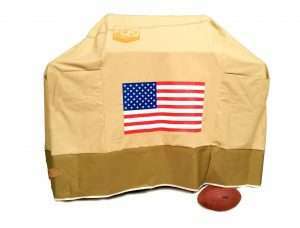 If this is not the grill cover you are looking for or have an other type of grill you can look at all our grill cover reviews on one page.